Former Sri Lankan president Mahinda Rajapaksa openly challenged his successor today, demanding he respect the “will of the people,’’ after the incumbent leader vetoed his ambitions to become prime minister. In a tersely written letter, Rajapaksa rejected President Maithripala Sirisena's accusations against him as “baseless'' and hinted he should head the government if his party won the vote. The two men belong to the same party and were allies until late last year, when Sirisena quit as health minister to stand against the veteran strongman in the January 8 presidential election. Yesterday, Sirisena accused Rajapaksa of fuelling communal hatred on the island and said he would choose one of seven senior members of their United People's Freedom Alliance (UPFA) as prime minister should it win Monday's general election. “Even if I have to intervene to form a coalition, you will not be the prime minister,'' Sirisena said in a five-page letter to Rajapaksa. Rajapaksa lambasted the president over the claims. “The allegations you have made against me are baseless. You have relied on outsiders to form these accusations,'' said Rajapaksa. 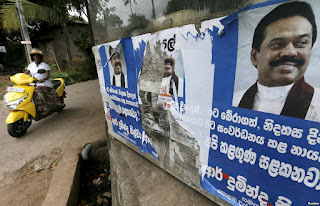 But Rajapaksa loyalists said the letter could damage their chances with just hours to go until campaigning ends, and appealed to the independent elections commissioner to bar the media from reporting it. The UPFA is seen as unlikely to prevail in the vote. Since his defeat in January, there has been an outpouring of corruption allegations against Rajapaksa's inner circle, including close relatives. His wife and two of his brothers are all facing corruption and embezzlement charges.